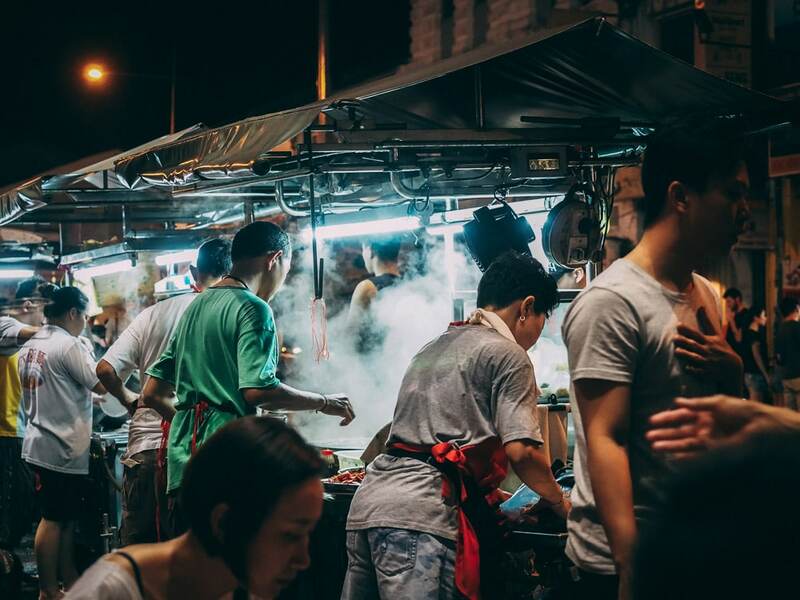 Penang is a foodie destination in Malaysia, and whilst the local dishes are delicious and there are many amazing places to eat in Penang, Penang also has a thriving cafe scene. 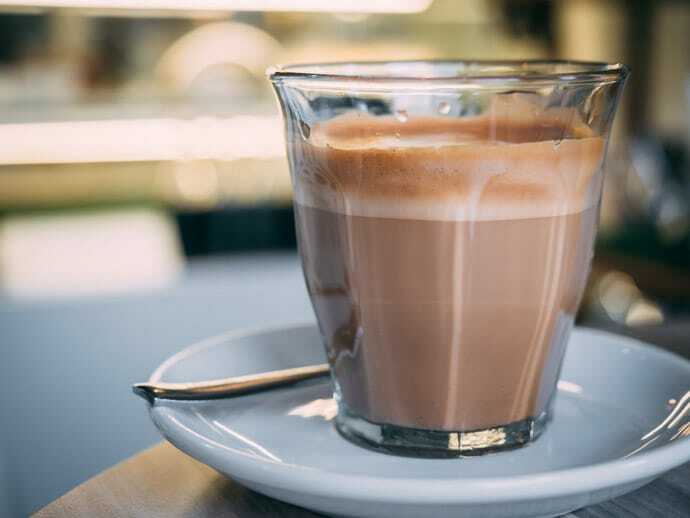 And whether you’re after a snack, a good coffee, desserts or a meal, it’s always good to know where the best cafes are. 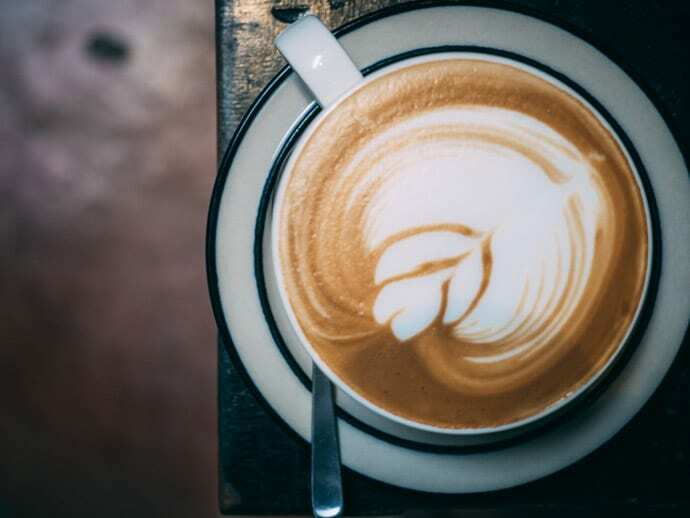 So here is our Penang cafe guide to help you find the best cafes in Penang. 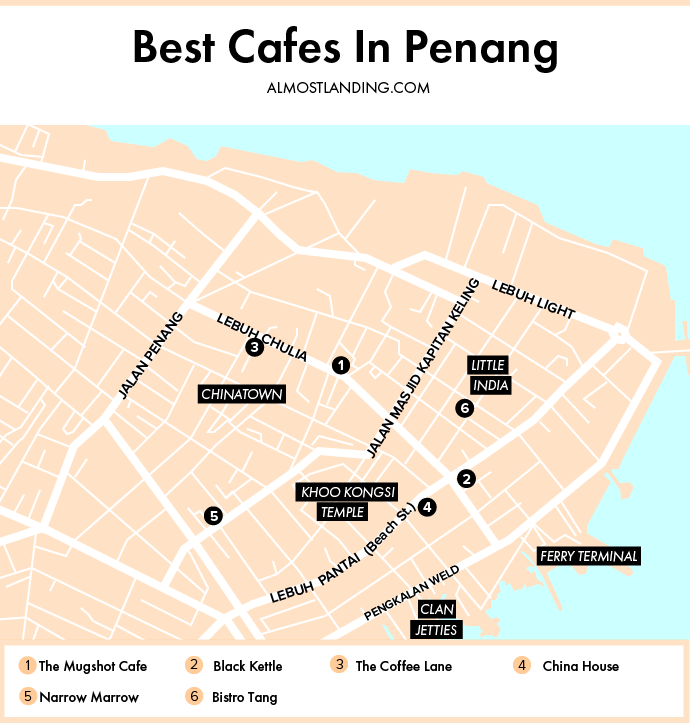 Here is our Penang cafes map pinpointing all of the best cafes in Penang. 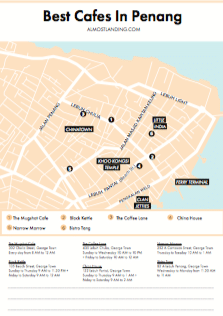 This map is of George Town Penang, as this is where most of our favourite cafes were found. 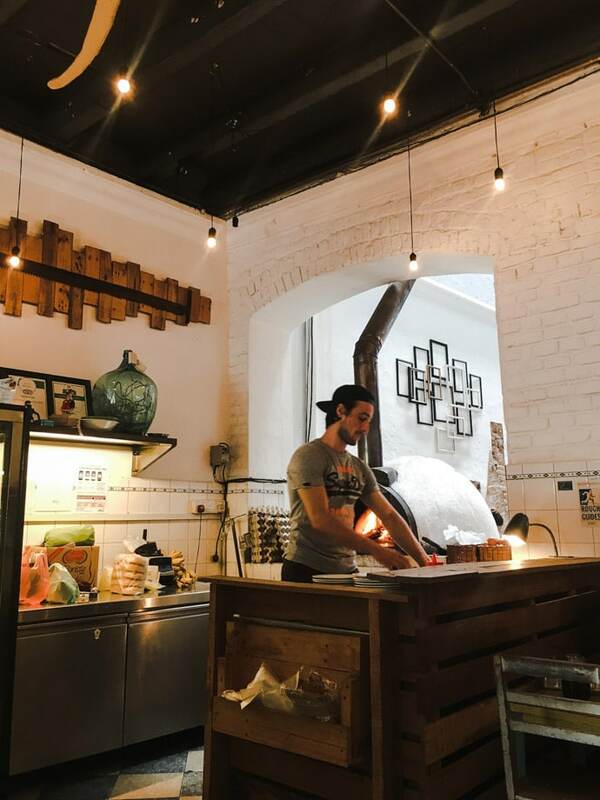 At the end of the post, you can download a printable Penang cafe map to save to your phone or print out and take with you for your trip to Penang. 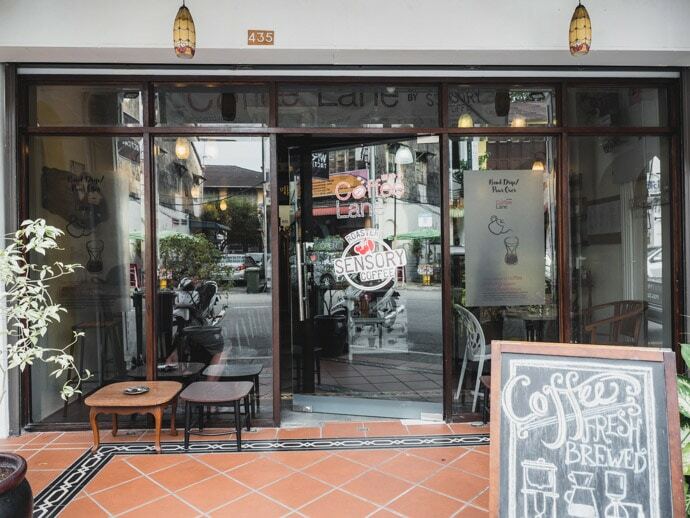 A popular and central cafe in Penang, Mughsot has a nice atmosphere on Lebuh Chulia. 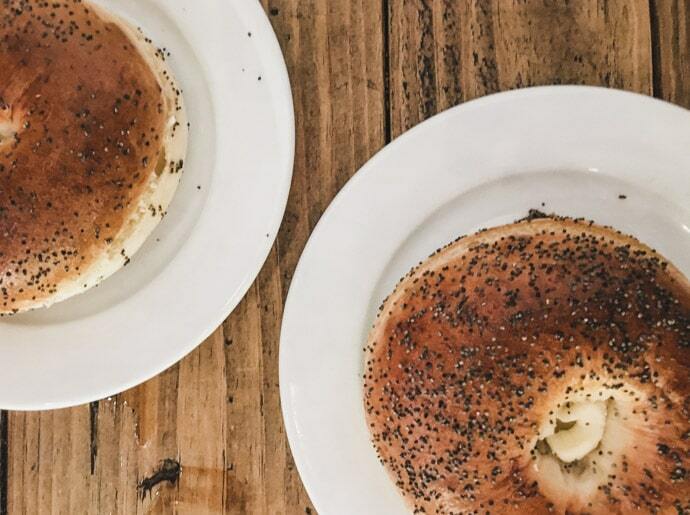 This became a regular cafe for us, we loved the mango orange smoothie, latte and most of all, the cream cheese bagels toasted in their woodfire oven. Every so often we would see the wood arrive on a motorbike from one of the locals. 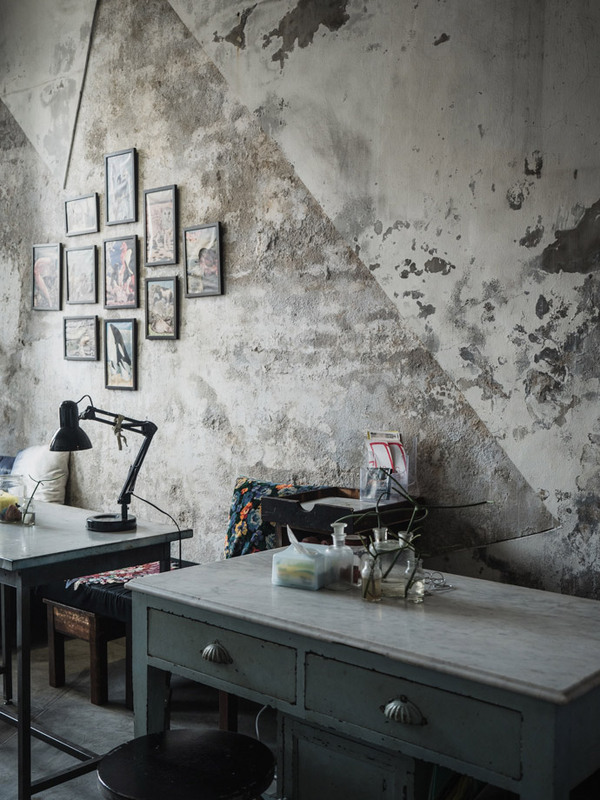 Mugshot is one of the best cafes in Penang. 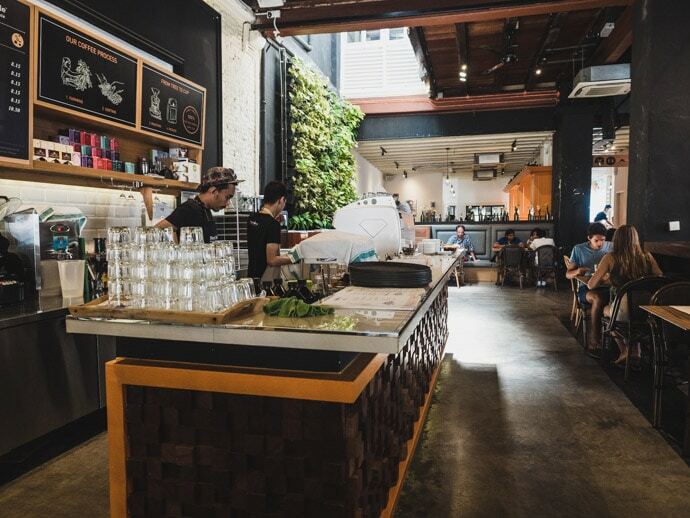 Black Kettle is a beautiful cafe in Penang with lots of seating. Come here for coffee, breakfast or lunch. They also have a good selection of bread and pastries. 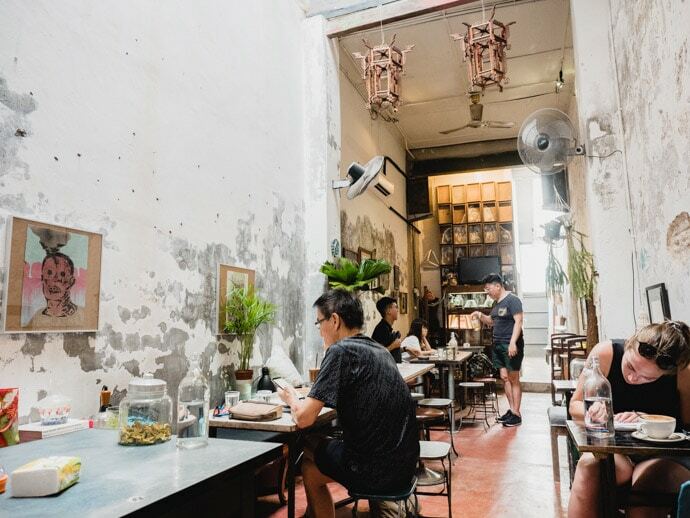 Located on Lebuh Chulia, The Coffee Lane is a great place to get your coffee fix in Penang, Chris enjoyed his flat whites here. If you love cake then China House is your cake heaven. Walk into this eclectic cafe and you will be met with a wall of cakes on display. Honestly, the hardest part is choosing from the huge selection. 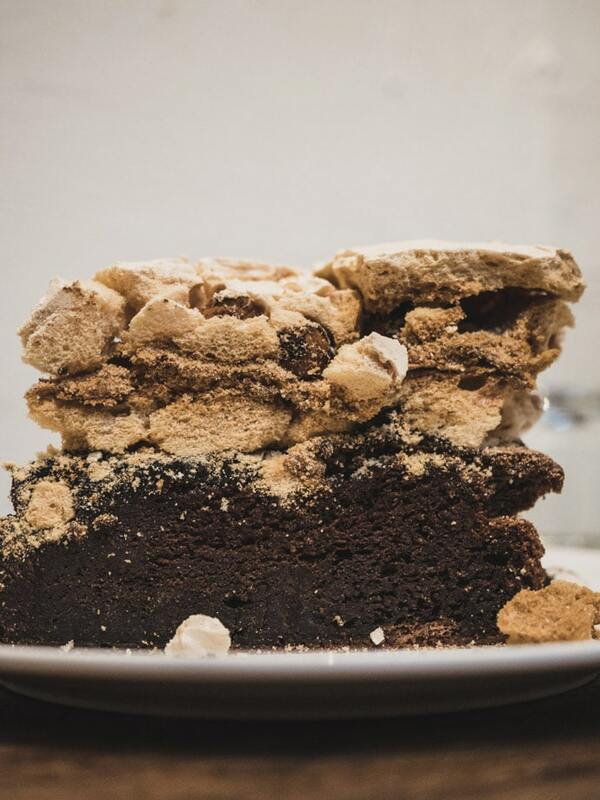 We loved the Chocolate meringue cake, but I don’t think you can go wrong with whatever you choose. They also have drinks and food here too, but for us, China House is all about the cake. It also happens to be in a traditional compound of three heritage buildings, with many different spaces to discover. Narrow Marrow is a beautiful cafe perfect for coffee, smoothies and a bite to eat during the day. You can also come here at night and try their toddy (palm wine). 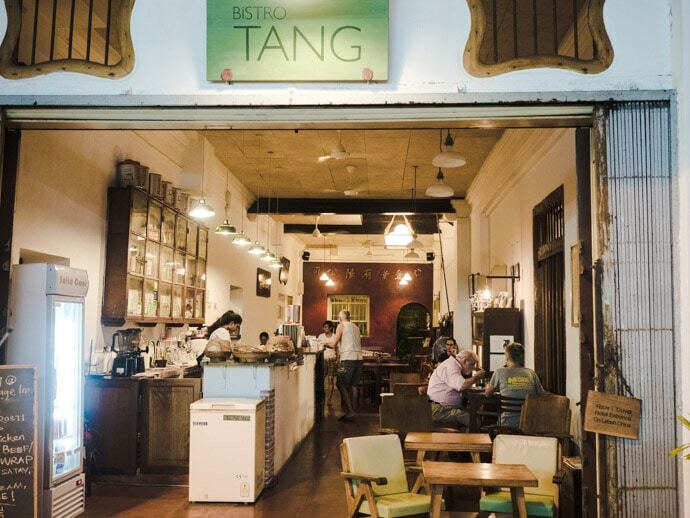 Bistro Tang, located in Little India, feels part cafe, part restaurant and has a beautiful design. 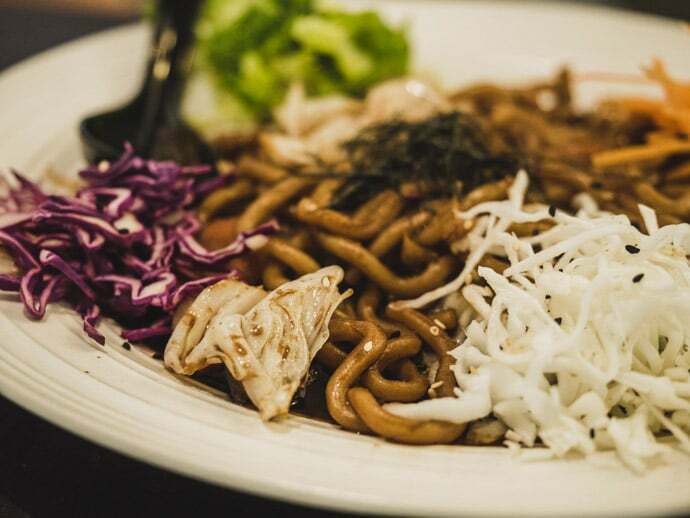 It has a great food menu, featuring both Malaysian food and western food. 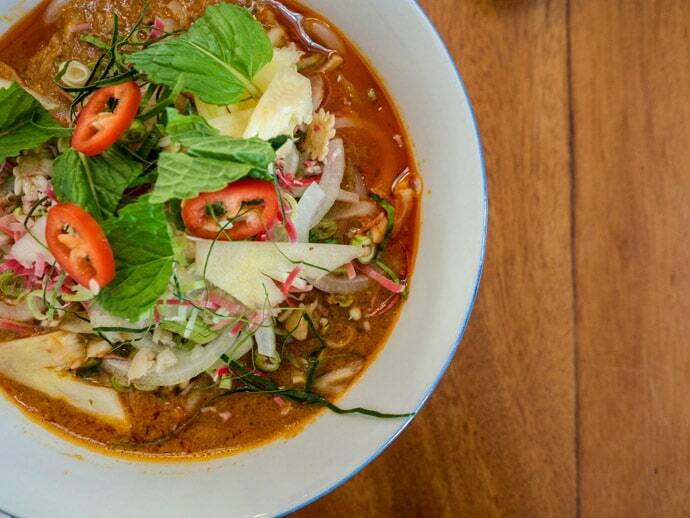 We loved the laksa which was full of flavour. You can also stay upstairs in their Penang accommodation, Ren I Tang. 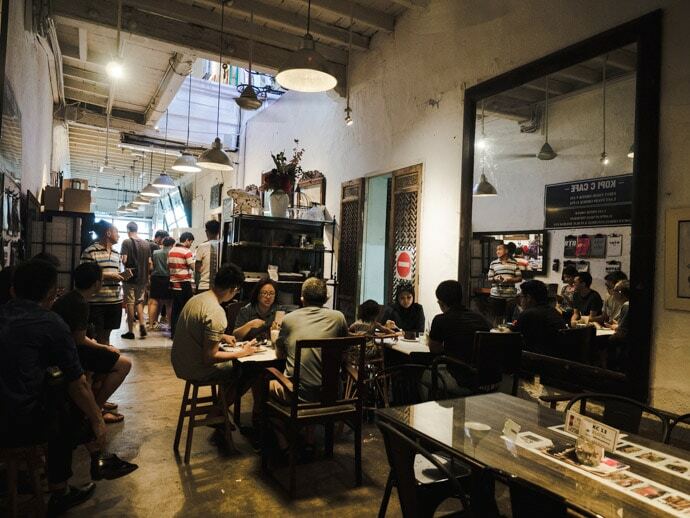 Get your free printable Best Cafes In Penang Map (PDF) to take with you. 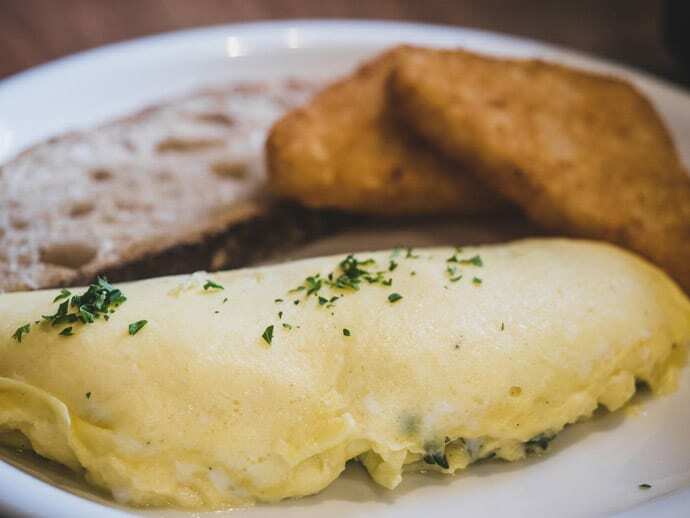 So that’s our favourite picks for cafes in Penang… what’s your favourite?